In my opinion the Python community is split into 3 groups. There's the Python 2.x group, the 3.x group, and the PyPy group. The schism basically boils down to library compatibility issues and speed. This post is going to focus on some general code optimization tricks as well as breaking out into C to for significant performance improvements. I'll also show the run times of the 3 major python groups. My goal isn't to prove one better than the other, just to give you an idea of how these particular examples compare with each other under different circumstances. One commonly overlooked memory optimization is the use of generators. Generators allow us to create a function that returns one item at a time rather than all the items at once. If you're using Python 2.x this is the reason for using xrange instead of range or ifilter instead of filter. A great example of this is creating a large list of numbers and adding them together. Not only is it slightly faster but you also avoid storing the entire list in memory! For performance critical code Python natively provides us with an API to call C functions. This is done through ctypes. You can actually take advantage of ctypes without writing any C code of your own. By default Python comes with the standard c library precompiled for you. We can go back to our generator example to see just how much more ctypes will speed up our code. Just by switching to the C random function we cut our run time in half! Now what if I told you we could do better? Cython is a superset of Python that allows for the calling of C functions as well as declaring types on variables to increase performance. To try this out we'll need to install Cython. Cython is essentially a fork of another similar library called Pyrex which is no longer under development. It will compile our Python-like code into a C library that we can call from within a Python file. Use .pyx instead of .py for your python files. Let's see how Cython works with our generator code. We also need to create a setup.py so that we can get Cython to compile our function. Not too bad but let's see if we can improve on this. We can start by stating that our "num" variable is an int. Then we can import the C standard library to take care of our random function. If we compile and run again we now see a really awesome number. Not bad at all for making just a few changes. However, sometimes these changes can be a bit tedious. So let's see how we can do with just regular ole Python. PyPy is a just-in-time compiler for Python 2.7.3 which in layman's terms means that it makes your code run really fast (usually). Quora runs PyPy in production. PyPy has some installation instructions on their download page but if you're running Ubuntu you can just install it through apt-get. It also runs out of the box so there are no crazy bash or make files to run, just download and run. Let's see how our original generator code performs under PyPy. Wow! Without touching the code it is now running at an 8th of the speed as the pure python implementation. Why bother examining futher? PyPy is king! Well not quite. While most programs will run on PyPy there are still some libraries that aren't fully supported. It may also be easier to pitch a C extension for your project rather than switching compilers. Let's dive further into ctypes to see how we can create our own C libraries to talk to Python. 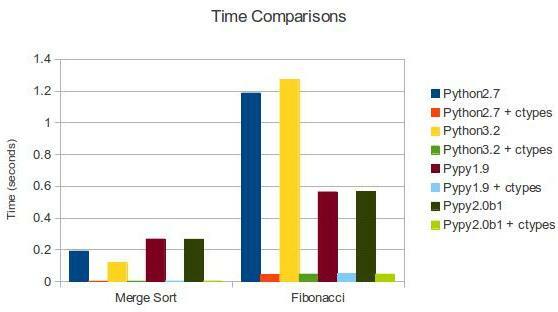 We're going to examine the performance gains from a merge sort as well as a calculation from a Fibonacci sequence. Here is the C code (functions.c) that we will be using. Using ctypes we can now access the functions by loading the "libfunctions.so" library like we did for the standard C library earlier. Here we can compare a native Python implementation vs. one done in C. Let's start with the Fibonacci sequence calculation. As expected C is the fastest followed by PyPy and Python. We can also do the same kind of comparison with a merge sort. We haven't really dug too deep into ctypes yet so this example will show off some of the cool features. Ctypes have a few standard types such as ints, char arrays, floats, bytes, etc. One thing they don't have by default is integer arrays. However, by multiplying a c_int (ctype type for int) by a number we can create an array of size number. This is what line 7 below is doing. We're creating a c_int array the size of our numbers array and unpacking the numbers array into the c_int array. It's important to remember that in C you can't return an array, nor would you really want to. Instead we pass around pointers for functions to modify. In order to pass our c_numbers array to our merge_sort function we have to pass by reference. After the merge_sort runs our c_numbers array will be sorted. I've appended the below code to my functions.py file since we already have our imports setup there. Here is a chart and table comparing the various results. Hopefully you found this post informative and a good stepping stone into optimizing your Python code with C and PyPy. As always if you have any feedback or questions feel free to drop them in the comments below or contact me privately on my contact page. Thanks for reading! P.S. If your company is looking to hire an awesome soon-to-be college graduate (May 2013) let me know!